Editor: In previous weeks, I’ve seen much discussion here on further development in Loudoun, specifically in the transition area around Aldie. Recurring talking points are the “Visions and Goals” laid out by the Stakeholders Committee, a set of objectives that don’t really point out what’s broken. I’ve been a resident or denizen of this area my entire life and some of the most disheartening sights of the past two decades include its modest surrounds getting enveloped in faux stone and pretentious titles. 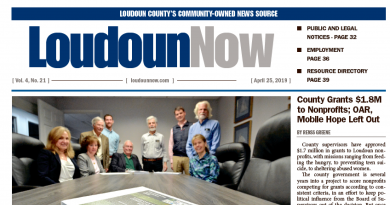 At the forefront is the main objective: Make Loudoun a great place. It implies we’re still getting there, that greatness is measured by the number of coffee houses within walking distance or bulldozers clearing the way for more “stuff.” But what truly made Loudoun great to its natives was humility and unique character. Small businesses and families that have known one another through the generations. As we have become the wealthiest county nationwide in average household income, a place where data centers are quickly supplanting barns and silos, our priorities have shifted from interpersonal connections to becoming the Joneses everyone envies. These efforts are conflicting with another key objective: Bringing people and places together. This can’t happen in a space where new streets outpace maps, where communication doesn’t involve looking up, and where landowners are more concerned with how much money can be made selling their properties to developers than preserving communal integrity. It especially can’t happen when we’re telling people who don’t like the changes here to leave; it is their very bond with this ground that retains them. If we don’t control growth, our future will be overshadowed by the same anonymity found in neighboring urban areas. Living much of my formative years on a farm, I learned about the final objective: Strengthening assets and nurturing people. Those assets are not found on a balance sheet; they reside within. Following in the footsteps of my grandfather, one of my earliest memories is walking the grounds of Belmont (Country Club) early June. Our gloves weren’t carrying putters or 9 irons, just the impressions of baler twine and the hope of getting the hay up before it rained. Later, we might stop by the local Chevron where he’d chat at the counter with Jeff and I’d get a complimentary soda. Maybe visit the fruit stand next door. We didn’t have much, but were rich in spirit. And with each rural destruction, each new cluster of popsicle-stick signs promising regality and grandeur, I see that spirit dimmed by the cold deception of those who’d have us believe Loudoun’s real value can be monetized. This frenzy to redefine our communities and give people what we didn’t have comes at the grave expense of providing what we did. What we need aren’t ways to make this county great. We need appreciation and fortitude to keep it great.